4 - 4..........Odin von Forell. Akim von Vaciweba competed in the D.V. Meisterschaft and passed the Körung 'for life' with highest rating for hardness and working drives (very pronounced protective instinct and pronounced courage). 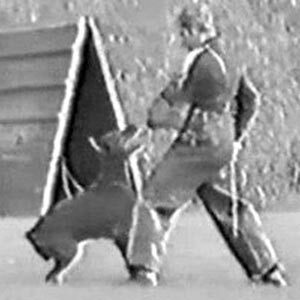 His brother Aick von Vaciweba scored highly many times in protection and 98 points in the 1982 Nordrhein Prüfung while his sister Alice von Vaciweba was the foundation female for the van Fellowstolz kennel in the Netherlands. Akim's sire, Yago von Ellendonk, passed the Körung 'for life' with highest rating for hardness and working drives and lived to 8 years of age. Bingo: SchH 3, FH and passed the Körung 'for life' with highest possible rating for hardness and working drives. He is sire of the von Warringhof “A, B, C” litters (Alfa, Aischa, Cöbes, Cher, Cocoa). Boris: SchH 3, FH and passed the Körung 'for life' with highest possible rating for hardness and working drives. He is sire of von der Weyermühle “C, E, D, G” litters (Gero, Gina); von der Klingenstadt “I, K” litters (Ijanko, Kira); von der Mooreiche “D” litter (Djenna) and vom Worringer Bruch “H” litter (Hanko, Hera). Björi: SchH 3 and placed 3rd at the D.V. Meisterschaft in 1988 with 287 points. Bo: SchH 3 and passed the Körung 'for life' with Körklasse 2A rating. She is dam of the von der Mooreiche “H” litter (Hassan, Hexe). Bandit: SchH 3 and D.V. Leistungssieger in 1994. He is sire of the vom Teufelshof “H, I, K” litters (Hesta, Kyira). Balou: SchH 3 and sire of the vom Teufelshof “J, L, O” litters (Lump) and vom Lindenhof “D” litter (Diane).